Chen Yaoye (陈耀烨, Chén Yào Yè, b. 16 December 1989) is a Chinese, professional 9-dan. 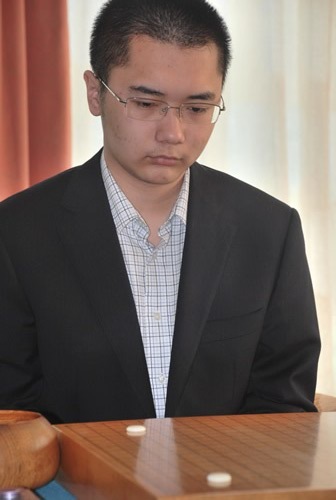 In 2012-2013 Chen was #1 in the Chinese Ranking and in the World Ranking; in November 2013 he became the fourth Cinese Tianyuan and Mingren at the same time, after Liu Xiaoguang (in 1988), Ma Xiaochun (1994) and Gu Li (2004). An Younggil has said that, "Chen’s style of play is very solid and territorial. He’s good at erasing his opponents’ influence and moyo." As such, he "take territory first and then invades. ... Chen is very good at sabaki." "He never rushes, but plays very safely and solidly," that his "defense is very solid and accurate," and although he "doesn't play gently even when he's in the lead," when winning he tries to simplify the game where he can. Chen Yaoye is very strong against Korean players. Especially against Choi Cheolhan. ... I think it’s because Chen’s style of play is very solid, and it makes it hard for Choi to lead the games towards his preferred dynamic fighting style. 2007: 9-dan - For getting at least two runner-ups in international tournaments. 2009: 23rd Tianyuan, ending Gu Li's six year run. 2009: 13th China-Korea Tengen, beating Kang Dongyun 2-1. 2010: CCTV Cup, beating Gu Lingyi. 2011: 25th Tianyuan, beating Zhou Hexi 2-0. 2011: 15th China-Korea Tengen, beating Choi Cheolhan 2-0. 2012: 26th Tianyuan, beating Zhou Hexi 2-0. 2012: 9th Chang-ki Cup, beating Tuo Jiaxi 2-1. 2013: 27th Tianyuan, beating Gu Lingyi 2-0. 2013: 9th Chunlan Cup, beating Lee Sedol 2-1. 2013: 17th China-Korea Tengen, beating Park Yeonghun 2-1. 2013: 26th Mingren, beating Tan Xiao 3-1. 2014: 28th Tianyuan, beating Ke Jie 2-1. 2015: 29th Tianyuan, beating Mi Yuting 2-0. 2016: 30th Tianyuan, beating Tang Weixing 2-0. 2016: 3rd Bailing Cup, beating Ke Jie 3-1. 2018: 1st Tianfu Cup?, beating Shin Jinseo 2-1. 2006: 10th LG Cup, lost to Gu Li. 2007: 19th Asian TV Cup, lost to Lee Sedol. Commentary of games four & five in Go World Iss. 108 pp. 32-36. After the 24th Tianyuan (in 2010), Chen held a record of 9-7 against Gu Li. After the 16th China-Korea Tengen (in 2012), Chen held a record of 9-1 against Korea's Choi Cheolhan, having won the last eight games in a row. As of 2013, Chen has held the Tianyuan title for five consecutive years & won the China-Korea Tengen four out of the last five times. At the time of Chen's promotion to 9-dan (in 2007) he became the youngest professional 9-dan. Chen was ranked #1 in the Chinese rankings on both 2012-08-31 and 2012-12-31.